Polskie Towarzystwo Wspierania Przedsiębiorczości S.A. (PTWP SA) is the administrator of personal data collected during registration and creating an account and its subsidiary PTWP-ONLINE Sp. z o.o. who is supporting the registration system and the publisher of the websites (PTWP OL). disclosing data to the organisers, partners and sponsors of the event in order to support communication with the participants or marketing of their services – in writing, by e-mail or via telecommunications devices (for example telephones, text messages); data of recipients of the above data will be disclosed and updated on relevant event websites or in informational materials. 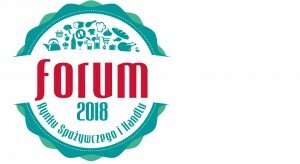 Participation in the Forum is free of charge for owners, boards and management of companies from the food and retail industry. No catering shall be guaranteed within the basic (standard) package and the participants shall not be entitled to participate in evening banquets organised during the event.